There are, of course, few things in this life more horrifying than the concept of a paper cut. Just thinking about it now is making me feel decidedly uneasy. But if you’d like to capitalise on that discomfort via the medium of videogames, Paper Cut Mansion might be exactly what you need. Here’s a huge list of indie games releasing in 2018. Announced yesterday, Paper Cut Mansion is a procedurally-generated roguelike horror game. 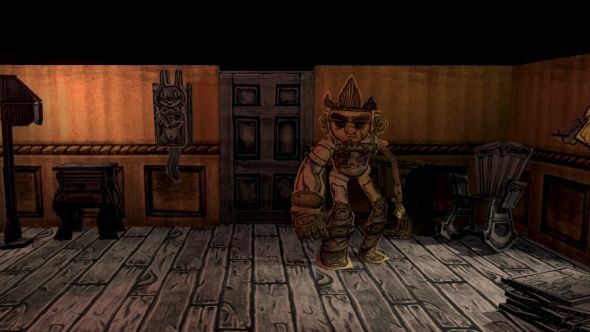 The twist, however, is that everything in the world of the game is made out of cardboard, from the characters (which were developed by creating real-life cardboard models and scanning them into the game) all the way up to the mansion itself. Your task is to solve a series of riddles to enable you to escape the mansion. The clues to those riddles are hidden in amongst the mansion’s furniture, but unfortunately there are plenty of threatening creatures lurking there as well. Developers Space Lizard say they’re “deep into production” on the game, and that it’ll launch a crowdfunding campaign to help complete the game later this year. You can watch the musical trailer for the game, which also shows off plenty of cardboard horror, above.